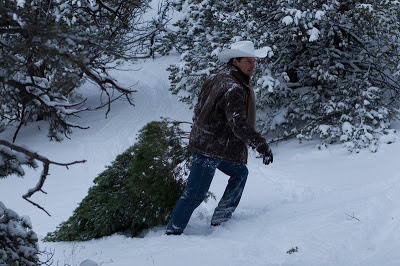 Title: Our Favorite Riley Moment -- Otherwise known as Fun with Christmas Carols while Trying to Win a Trip to the Ranch Because That Sounds So Much More Fun Than Playing in the Cold Rain When it Rightly Ought to be Snow if we Dropped a Couple of Degrees. While visions of Paul's pastries danced in their heads. Were wandering downstairs, can you imagine that? We sprang out the door to see what was the matter. And had just kicked a hole in the side of the barn. Set everything in sight with a wonderful glow. But a very old Indian with a long golden spear. Forgetting of course he could be such a hellion. For the tops to come downstairs and determine their fate. around the barn and away from the Indian. Not even Jasper, who was doing some investigating. Doing something they were sure they really ought not. They drug out the tree they had cut yesterday morning. Against the biggest tree that they could have sought. and to get it steady and upright was really quite hard. they came up with some ornaments, a collection quite large. The tree was decorated and looked quite great. wondering how to get back in bed without any quivering. going quietly downstairs wanting everyone fed. for the shine in the windows was really quite bright. at a decorated tree where once there was none there. It was something to behold in what was just white. but the looks on their faces had him questioning. at a tree they'd left dark not three hours ago. Happy Christmas to all and may it be quite Merry! This is the sweetest thing!!! I love Jasper! !